The Guarani Kaiowá are one of Brazil’s most populous indigenous people. Kaiowá means forest people, except that they have no forest any more. It has all been cut down. They have been cleared off their lands in Mato Grosso do Sul state in successive waves, and dumped to fend for themselves in tiny, overcrowded reserves. The battle for space in Mato Grosso do Sul is tough. Land in the area is earmarked for lucrative sugar cane production. 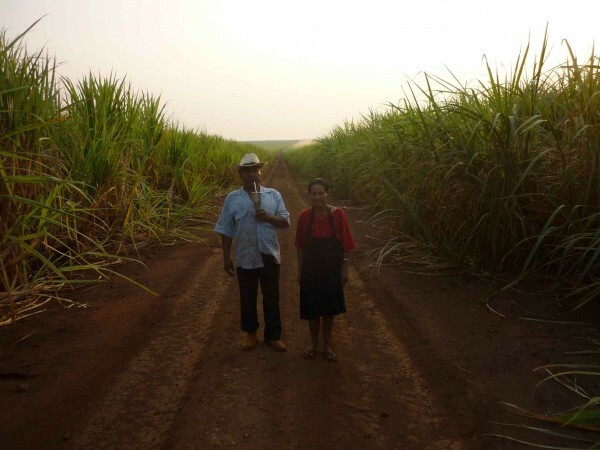 Below Seu Nelson and Dona Antonia stand between fields of cane planted on ancestral land. The 1988 Brazilian constitution guaranteed Brazilian Indian land rights, and in the 1990s small groups of Kaiowá families began to leave their reserves to reoccupy their ancestral lands. This tactic, although painful and slow, has resulted in some success, and a number of traditional territories have been reoccupied. 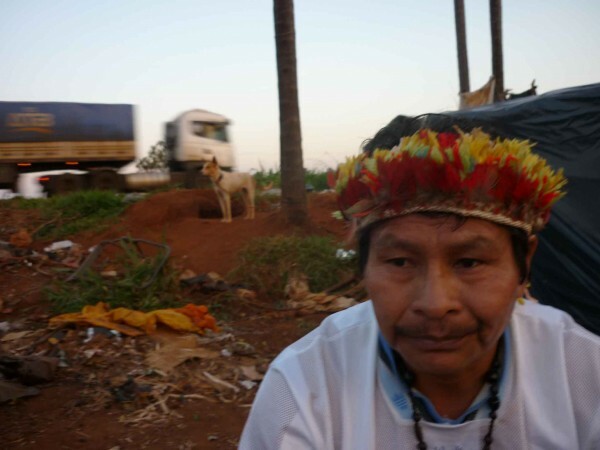 35 territories are still in question and throughout the state Kaiowá families are camped by the roadside in shacks covered by black plastic sheets. Above, leader Zezinho explains tactics at the Ñanderu Laranjera camp. Despite the heat and the dust, spirits are high, and Kaiowá elders pass free hours passing on traditional customs and prayers to the younger generations. 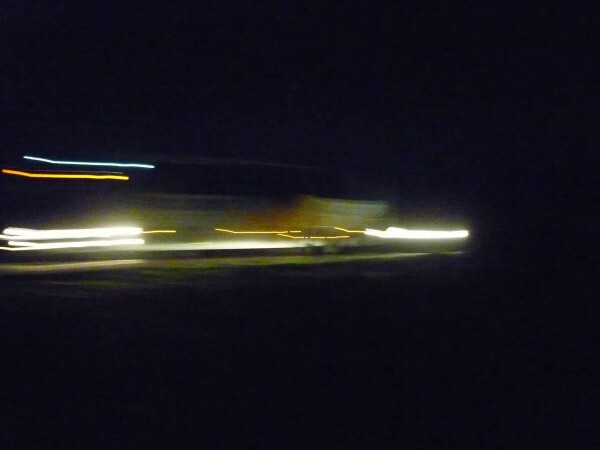 Below, photo of a traditional Guaxiré festivity, held in the dark while trucks speed by in the pitch dark at speeds of up to 140km per hour. The Kaiowá struggle has been brought to the big screen in the film Birdwatchers by Chilean-Italian director Marco Bechis that won the One World Media Award in June. 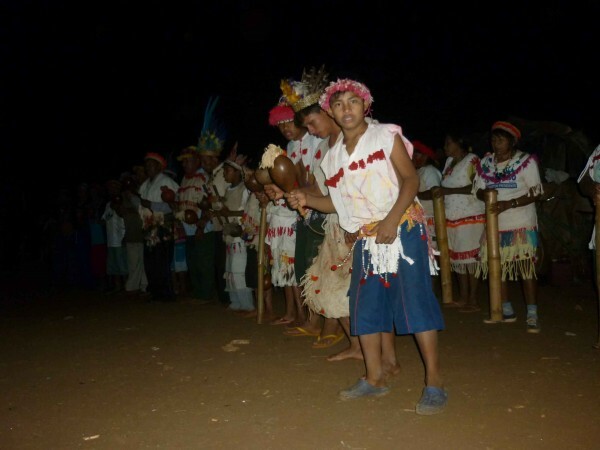 For more information on the Guarani Kaiowá and how to support them, see the site of Survival International.